How Did You Reflect and Recharge This Summer? Summer for educators is often a time to look back on the past year—and look forward to the coming one. What worked, what didn't, and what will you change? Educating the whole child and planning for comprehensive, sustainable school improvement requires us to be "whole educators" who take the time to recharge, reflect, and reinvigorate. Last summer the Whole Child Podcast highlighted educators' need to reflect, refresh, and recharge. ASCD's Kevin Scott was joined by ASCD Emerging Leader Program alumni Peter Badalament, principal of Concord-Carlisle High School in Massachusetts, and Jason Flom, director-elect at Cornerstone Learning Community in Florida where he was a founding teacher of the elementary school, to discuss their strategies for reflection. Post written by Ashley Allen, a master's student in communication management with an emphasis on marketing at the University of Southern California. She received her bachelor's degree from San Jose State University last spring and hopes to use her writing skills to make a difference. Susan Kessler, April Snodgrass, and Andrew Davis of Nashville (Tenn.) Public Schools discussed the struggles of being a new principal and shared valuable insight for surviving the first year during their 2014 ASCD Annual Conference session "When Do You Sleep: Surviving the First Year as a Principal." The dynamic trio each shared tips that have played an integral part in their own success. My oldest son is ending his elementary school career this week and I've been taking some time to reflect on his life and on my experiences as a teacher and educator. The end of year celebrations are a huge time drain and struggle as a teacher, but as a parent, it's one of the few times we are able to peek into the world own kids live in on a daily basis. Teachers work every day for the benefit of their students. Learn how other educators make a difference in students' lives and learning in a special summer issue of Educational Leadership and get inspired. This digital issue gives you instant access to stories about individuals, teams, schools, and even a U.S. state that are passionate about teaching and learning. With so much energy devoted all year long to tackling problems, summer can be a good time to recall why you went into education in the first place, reflect on your many accomplishments, and think about the good you have done and will do in your life as an educator. It's not about self-congratulation, but about looking inside yourself for the rejuvenation and answers only you can find. As the school year winds down, teachers are spending as much time reflecting on the past year as they are thinking about a summer filled with sit-down lunches, obligation-free evenings and weekends, and restful nights without dreaming about school. Throughout the year teachers reflect continuously on particular interactions with students, a given lesson, or even a whole school day because they realize it is the key to improving their practice. At the end of the year, however, teachers should take time reflect on how things went overall to set themselves and their students up for success next year. Without a framework to guide teachers, reflecting on the entire school year can easily turn into spiraling self-talk with few results other than "this was the worst year ever" or "this was the best year ever." 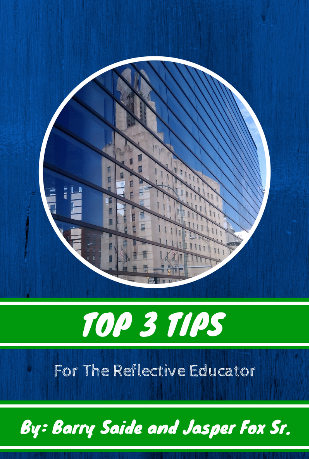 Nevertheless, teachers can engage in focused reflection that will truly help them to better meet the needs of the kids they will meet in September. Personalized learning has proven effective for empowering students to monitor their learning, establish goals, and reflect on progress. As the the Common Core State Standards (CCSS) have become a target of focus for educators, we must consider how we are embarking on this learning journey as adults. Providing a professional atmosphere for personalized learning is essential in supporting teachers through the CCSS transition. Each educator brings forth a unique background based on professional style, years of experience, and depth of CCSS understanding. As learners embracing this educational mind-shift, we each inevitably need something different as we engage in trainings and conversations related to the CCSS. Our learning experiences should not be a one-size-fits-all approach. Nor should professional development send us into information overload. As learners, we should be inspired to interact with the knowledge and perspective of the CCSS in order to find our own place within the transition. Learn. Teach. Lead. This Time with Passion! In order for me to lead effectively in my classroom, I needed to make sure I was teaching the right things. Otherwise, what were students learning? And, why were they learning it? Students need to be personally invested in their learning in order for them to be most successful. What's taught needs to be relevant to them. The curriculum can be rigorous to the 10th power, but if it isn't taught in a way that is engaging and fun, students will not produce work that is reflective, vulnerable, risky, and potentially full of mistakes. Here at ASCD, the Whole Child Initiative drives our daily work—regardless of what our job descriptions entail. As a former teacher, I am particularly devoted to supporting the whole child and ensuring the safety and health of every student I encounter. Keeping the whole child in mind, I post content for ASCD's Inservice blog that consistently reflects our commitment to fostering a healthy, safe, engaging, supportive, and challenging environment for students.